The final steps in the Central Vermont van project involved many little delicate steps. It's those details that make or break the project. 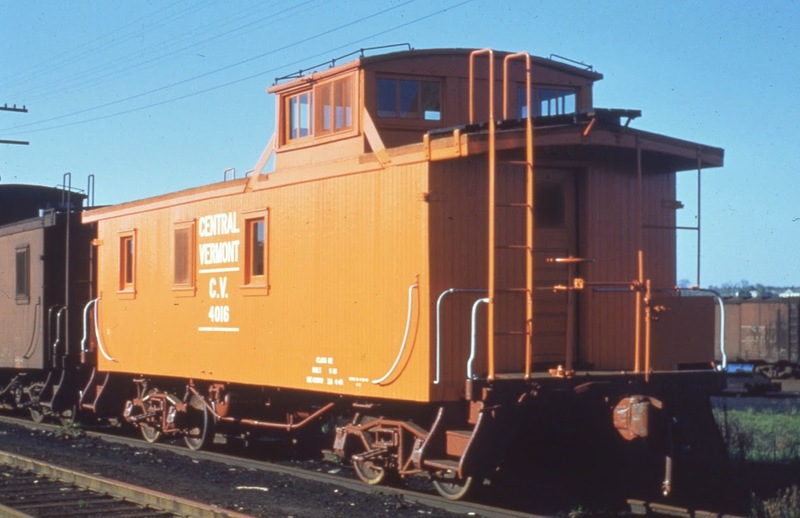 The cars were painted with Morency Orange bodies, CN Red #11 ends and underframes and black roofs. The first 2 colours were from the CNLines SIG paint line that was created by Scalecoat paint. Very accurate colours and great paint. The black was Floquil weathered black. I laid in a supply when the end of Floquil was announced. Once the paint had cured, Microscale decals were applied and numbers were assigned based upon the clients direction. One of the vans had the Maple Leaf emblem applied, while the rest had the "stacked" lettering in the centre of the car body. It's a shame that Microscale didn't get the green right on these decals. It should have been much brighter, but it still looks good. The cars were flat coated to seal the decals and the parts can start coming together. I waited until the flat finish had been applied before adding the glazing. That helped to keep the windows clear. One of the long vans had wide flat metal braces added in it's history, these were formed from shim brass and prepainted. Far better looking than the lumpy cast resin ones offered in the kit. Before attaching the bodies to the floors I painted the railings and grabs white. It is going to be much easier to do this now rather than later with the end platforms in the way. Now the bodies can be attached to the floors. There is a lot of weight in these cars at the client's request. He wanted the cars to match the weight of his brass versions. Kinda makes sense. All the end railings had been prebent and painted, along with mounting holes drilled before the floors were painted. So it was a simple matter of trimming the railing legs to length and securing in place. All the ladders have "railings" on the top and all of these were mounted through holes that had been drilled through the lateral running boards and then the bottoms secured when everything was square. The running boards were painted to represent a raw wood appearance. I used Floquil foundation and then a couple of passes with raw umber oil colour. The digital images don't really show the colours properly, it's a lighting thing as well, but I'm very pleased with the effect. All the cars were given a wash of thinned india ink, which toned down the electric orange as well as gathering in the nooks and crannies. All were then sprayed from the underside with either thinned black or thinned railroad tie brown to represent the road dirt that accumulates. This was a fun project. A little out of the norm for me, I don't get a lot of cabooses to build. Which is too bad. It was a nice departure from boxcars. The only sad part was having to explain to my nephews what a caboose was. Last evening we received word over the internet that Larry Kline has passed away. Certainly a surprise for many of us in the prototype modeling community. Larry was an active model railroader his entire life, and was continuing to work on his home layout. He was an outstanding modeler in O scale, with particular interest in trolley cars. He was a skillful scratchbuilder and had completed a number of ambitious projects, some of which won national contest recognition. Larry's home layout was set to model the Pittsburgh area, allowing him to include a number of railroads: Western Maryland, Baltimore & Ohio, Pennsylvania, Pittsburgh & West Virginia, and Pittsburgh & Lake Erie (P&LE). Larry was especially active in the P&LE Historical Society and had edited its magazine, "The Little Giant," for a number of years. He was also active in the National Model Railroad Association at both the local and national level. He often presented talks on both modeling and prototype railroad topics at local and national meetings, including the Prototype Railroad Modelers (RPM) meets around the country. He was co-chair of the recent series of RPM-East meetings, held in alternate years in the Pittsburgh and Philadelphia areas. Larry was always generous in sharing information and modeling approaches with others, and wrote numerous articles for hobby publications. He also contributed regularly to several on-line discussion groups. There is no question he will be missed by many. I will remember Larry as that soft spoken guy who always had a smile. Doesn't get better than that. I know what you're thinking. Cupolas!? Big, fat hairy deal. What's the fuss. As I mentioned is a previous post I was missing a pair of cupola ends. I went to my friend Clare Gilbert of Sylvan Scale Models to get replacements made. Initially I was told that it would be Thursday or Friday, given how busy he is. Imagine my delight when Clare emailed me last evening and told me my parts were ready. I drove the 45 minutes to his place this morning, bright and early. Came home and assembled the cupolas and added the railings. Tomorrow I have a few details to add and then I can fling paint at these babies. It is this kind of helpfulness from a fellow manufacturer that helps restore my faith in humanity. With a few notable exceptions I have found that the small model train manufacturers are ridiculously generous with their time. Since the inception of both Elgin Car Shops and Yarmouth Model Works, I have worked with and been helped out by so many people. And there's no way I could realistically repay them for their kindnesses, except to mention them here from time to time. Actually I'm quite pleased with today's efforts. This morning was fully devoted to assembling the ladders required for the 5 vans. The starting point for the long van's ladders was an etching set from Sylvan Scale Models. The set included stiles for 2 ladders and open style caboose steps. Sadly this item is no longer available. Using this photo as a guide. I trimmed the stiles to length, bent up the top portions of the handholds and proceeded to assemble the ladders. I also cobbled up a wooden spacer to hold the rungs and the stiles while everything got soldered together. The top hand holds were soldered to the stiles. Note that there will be left and right hand stiles. .010" wire was cut overlength for the rungs, threaded into the holes in the stiles, the whole mess clamped into the block of wood and soldered together. Do that 7 more times. The secret, I've found for soldering these small items, is flux. I use good old plumbing solder flux. Works brilliantly. Just rinse it off once your done. The ladders for the short van are a little different. For them I used a set of Yarmouth Model Works 14" ladder stiles which had to be trimmed to fit under the eaves of the roof. As well these ladders have a different shaped set of handholds at the top. I used my newest favorite tool, my Hold and Fold etching bender to fold the angles in the stiles and using the prototype photo as a guide created the handholds. I used Tichy 18" grabs for rungs, clipped the legs very short and one at a time inserted and soldered the rungs in place. This is the first time I've attempted to soldered my ladders rather than using CA. I felt the extra strength was required. I pleased to report the mission a success. The handholds were then soldered in place and the ladders were done. You'll note that with both types of ladders, I've left the wire on the handholds rather long. They'll get trimmed once the ladders are actually installed. I plan to drill down through the roofs and have those bits of wire pass through the roofs far a more secure mounting. These cabooses (Cabeese?) require careful planning as the end nears. The cars require painting and weathering before final assembly. The floors are CN Red #11, the car bodies are Morency Orange and the roofs are black. The paint, the flat coat to seal the decals and much of the weathering has to be applied before the windows get glazed. Then everything can get finally assembled. Have to be careful not to build myself into a corner. And now we wait. I had to have a set of cupola ends cast up since one of the kits was missing the cupola ends. It was faster for me to run down to see Clare Gilbert at Sylvan Scale Models, than it would be to have F&C send me replacement parts. Think I'll build a boxcar for a change of pace. I'm in the process of building 5 Central Vermont vans,(yes vans. CV is/was part of the CNR system and they're called vans up here in Canuckistan). The client supplied a good number of photos for me to work from to help with details and weathering patterns. One of the vans is this short USRA style van. You will note that this end of the van has no brake wheel. Abnormal for most vans/cabooses. We checked and there's a builders photo of this van and it clearly shows no brake wheel on this end. This will slightly simplify the brake rigging by eliminating the 3rd brake lever common on caboose/van brake rigging. This F&C kit provided another challenge early on. 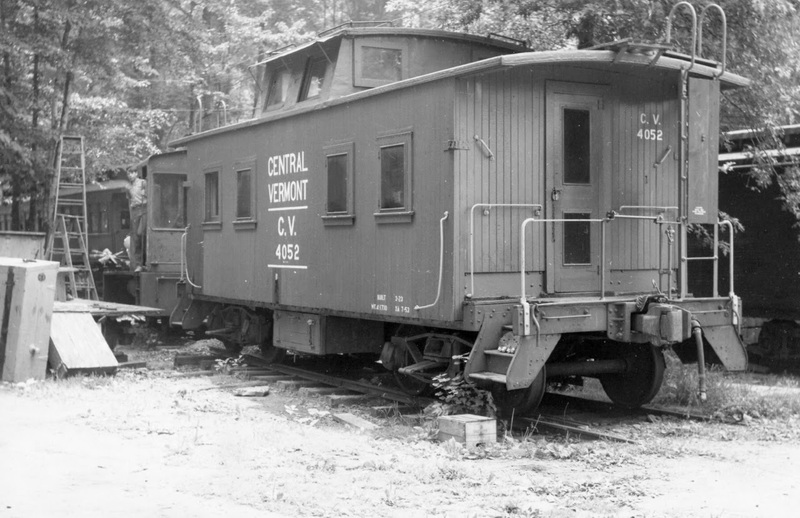 The kit was originally designed to represent the USRA cabooses used by the Ulster & Delaware and the NYC. Those cars had cast iron stirrups rather than the steps as shown on the CV car. As this photo shows, using the bolster location would restrict the truck swing thus generating a static model. Not the point of the exercise. So I relocated the truck screw holes after filling in the space between the centre sills with some styrene. From there I could finish the brake rigging and get ready for the really challenging aspect of this job. The end railings and ladders. That blog will come later. This is what the finished underframe looks like. Compare the preceding image to this next one and you can see the difference that having only one hand brake makes to the brake rigging. And this is what 5 vans under construction looks like. Tomorrow the steps and railings get started on the 4 long vans. And no, I won't forget the cupolas. As you can see from the pictures, Bill Welch has been very busy. These various fittings were hand made by Bill, using his Dremel as a lathe. Bill has a talent that I envy. I'm very much looking forward to getting this model onto the market. The platforms will be a standout as well. We have to still sort out the ladders and the artwork for the decals, but for the most part everything else is done.